'I fancy a walk to the woods, to see that upended tree,' Mr says. His eyes are narrowed, ready for peering. We look out of the windows. Debris blown from hedges and bins escapes across the currant patch. Cloud cover; unfathomable. Plaintive whir of wind circles the old aerial. We try the back windows, just in case. Next door's tall fir bends. Is that a full ninety degrees? I'm thinking. We know at Northcott Mouth these winter storms have uncovered remains of a wrecked ship; we have no tide table, we just like the idea of it. It's enough. Once you have the spark, you should follow it. The espresso pot burbles. Coal scrapes loudly from the scuttle into the red mouth of the little Rayburn. Where the wreck lies, the waves are foaming. They make sea-snow over sharp dark rocks. 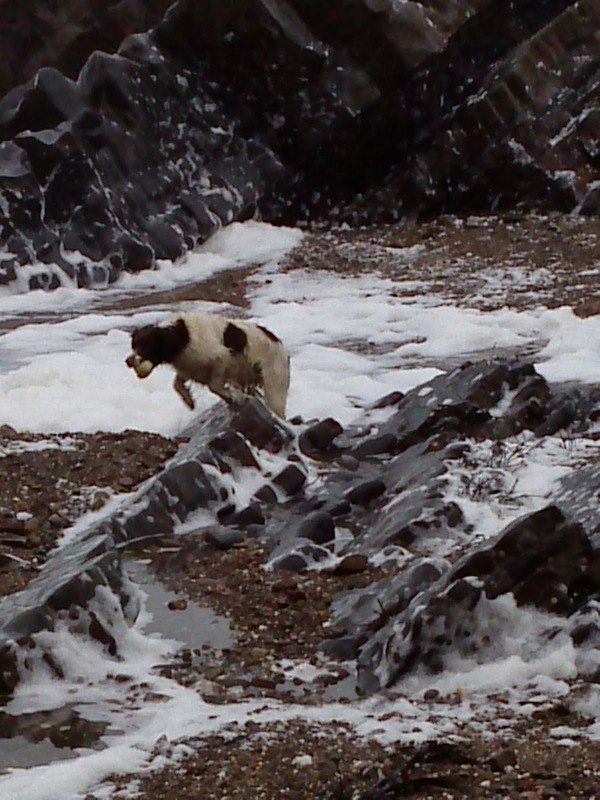 Foam bobbles fly over bared pebbles, over storm-killed seabirds, over the bold plastic flotsam, up to the crumbled footings of cliffs. They move in puffs; erratic yet assured; like butterflies, like ghosts. In pursuit we stumble, over loose sliding cobbles, around the feathered dead, over to the slanted exposures of rock, a mere ship all forgot, minds filled with geological form, texture, the white globules dancing. 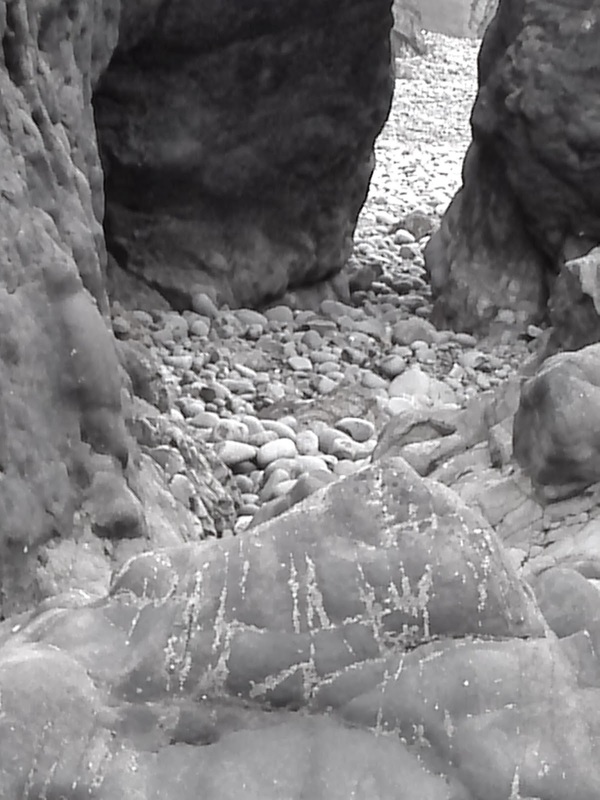 A break in the rock is a portal: another arc of beach lies beyond. 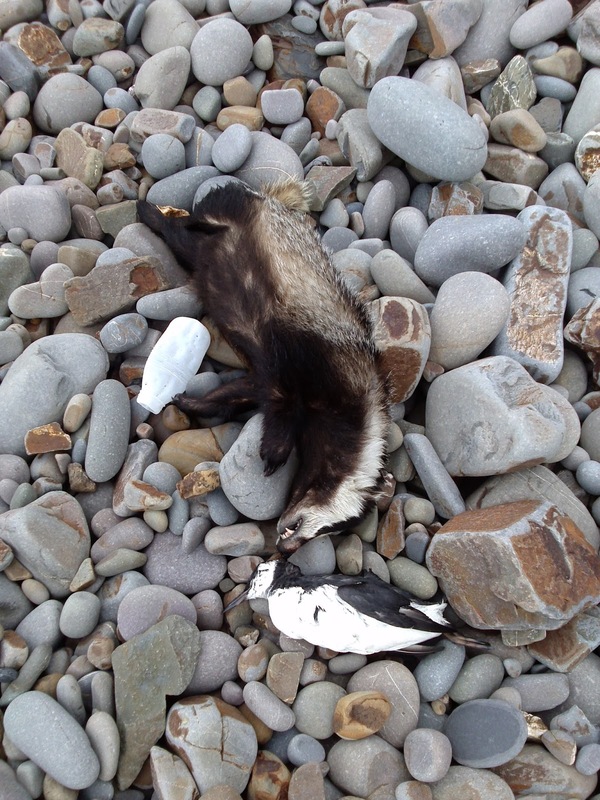 Here on the smooth stones lies, oddly, a badger with a seabird, his snout pushed out towards the bird's reposing head, an uncapped bottle at his claw tips. Eyes of the bird hold a faint gleam: unpolished jet beads. Those neat wings, made for diving. We stand awhile to note the curve of their resting. So much purpose in each form, a sense of movement is retained even in death. 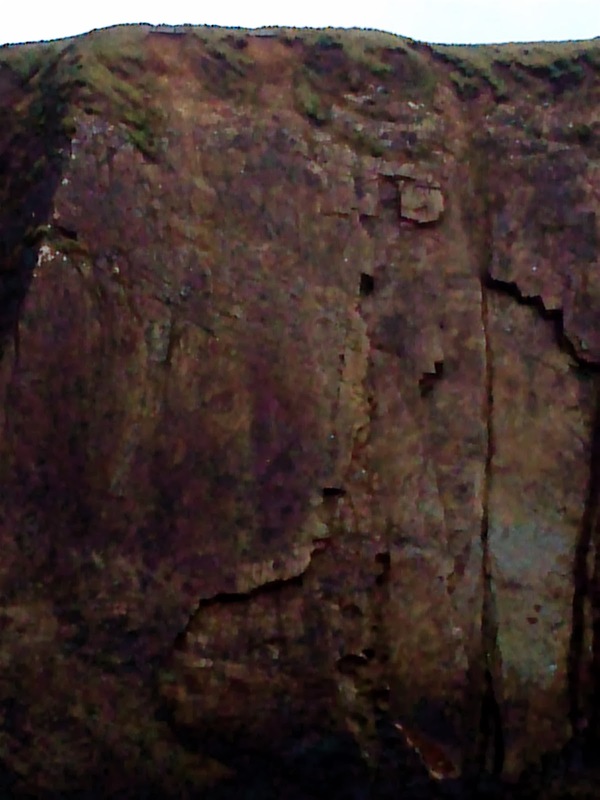 More than we look up, the precipice looks down: stern and ancient. Around our feet, sea-snow flies. In the hedgerows, on the drive home, we count springing flowers: dandelions, snowdrops, daisies, celandines, narcissi, one clutch of purple crocus. The beach was sublime, we say, adventurous, bizarre.